Now that I've just finished two more terrariums, I think it's finally out of my system for the time being. 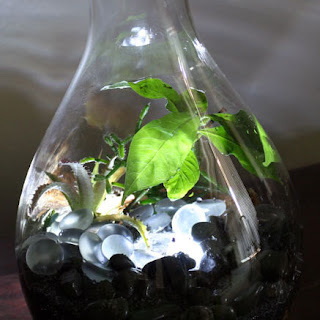 Rather than just introduce my two latest projects, I'm making this into one big honkin' round-up post with every terrarium project ever featured on The Rainforest Garden. I'll start out with my new wardian case and 'black reef terrarium' before re-introducing some familiar faces including two bonus 'non-terrarium' projects. That makes ten! TEN projects. Bla ha ha. This affordable wardian case from Ikea puts a modern twist on a classic idea, and is perfect for keeping houseplants that like it warm and humid. Wardian cases were first used by the Victorian English to accommodate plants from the tropics in their decidedly un-tropical climate, since they act like mini-greenhouses by trapping in warmth from the sunlight. My wardian case also traps in the heat, and if you can easily notice the difference when you open it up and stick your hand inside the little sauna. 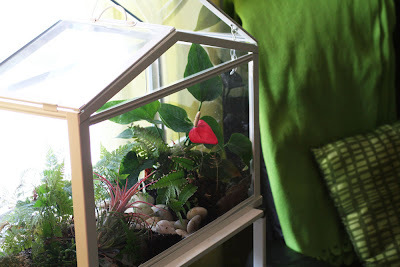 I divvied this terrarium up into two halves, setting a fern and its rootball on one side and an Anthurium on the other. Then I surrounded them with sand and potting soil, mounding it up to the top of each rootball to make little hills. I've left the area in the center empty for now. Next I nestled some large rocks amongst the 'hills' for a natural look, and then I added some epiphytes (plants that grow in trees) on top of the mounds for interest. A blooming Tillandsia adds a little bit of color, and some Rhipsalis plants lend a bit of fine texture for realism. The resurrection fern under the red Anthurium flower will let me know when the terrarium needs watering by shriveling up its fronds and turning brown. When I water, they magically perk up! In the center of the planting, I've laid down some polished white river rocks to give the impression of a jungle stream. 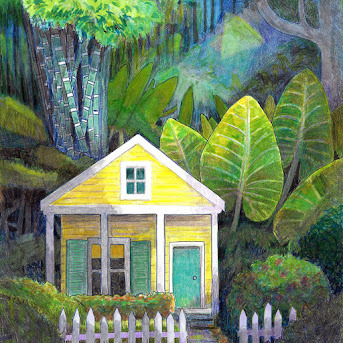 They also give the eye a place to rest amidst all of the lush growth! I may have waited over a year to do anything with this beautiful little case, but the important thing is that I DID eventually fill it with plants and now it makes my home office look awesome. This one reminds me of a Hawaiian reef. Do you see it? Just imagine that the spiky Tillandsia is a sea urchin, the branched Rhipsalis cactus is coral, and then picture them both sitting comfortably on the black volcanic floor of a Hawaiian reef. 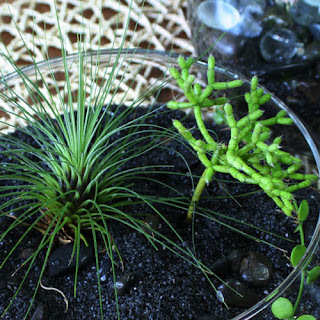 I've chosen plants with bright green colors to contrast against the deep black sand and make a dramatic statement. I wanted to make a new terrarium to match the glowing one that I recently designed, so I dismantled the Beach'n Terrarium from a couple of months ago and started from scratch. It's okay to do that from time to time. I've removed all of the plants and seashells, put down a layer of black sand, and added three plants: A Tillandsia, A Rhipsalis cereuscula cutting and the same rooted Dischidia cutting from the beach project. 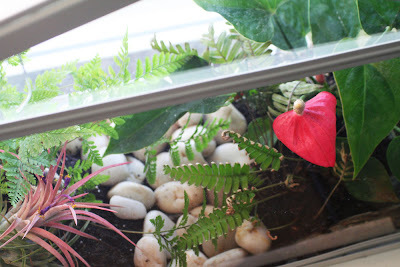 Since I planned out the colors and plants ahead of time, this terrarium only took about a minute to make. Here are some other terrariums from my blog, along with instructions for each project. 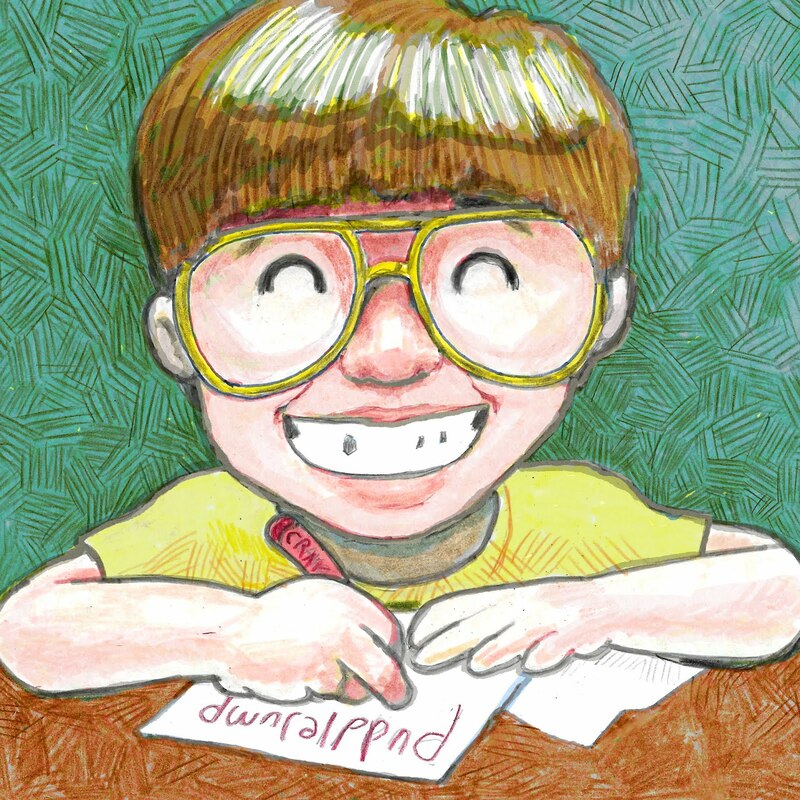 Just click on the heading to be magically transported to DIY bliss. Oh, and guess what? At the end of the post there are even some bonus projects. 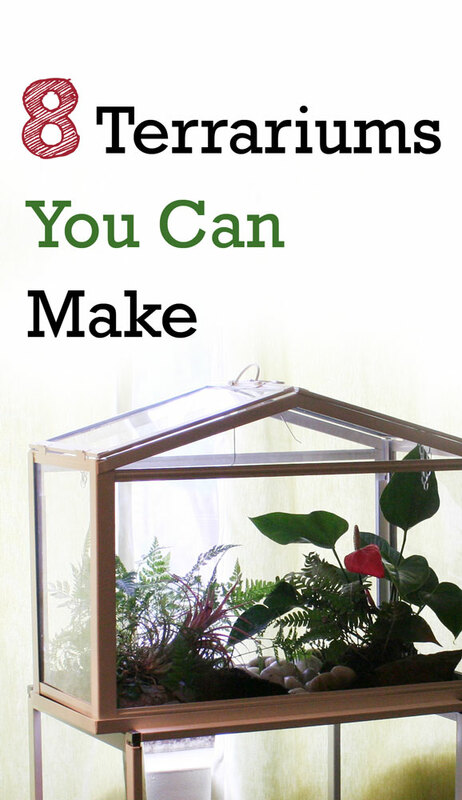 My first terrarium is easy, simple and a lot of fun. Look at this as a basic terrarium recipe, and replace the moss with whatever plant you choose. Moss is rather picky in terrariums, but if you use the right kind (Moss Acres has the good stuff) and provide air circulation and filtered (not hard) water, the moss will live longer. Mine looked good for well over a year before the hard water took it's toll. 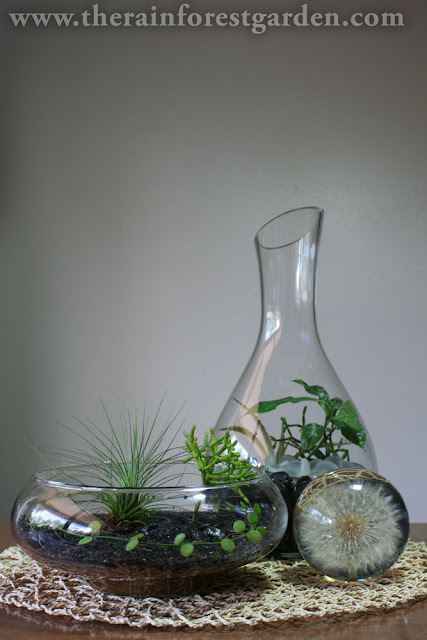 Terrariums don't have to be all deserts and jungles! 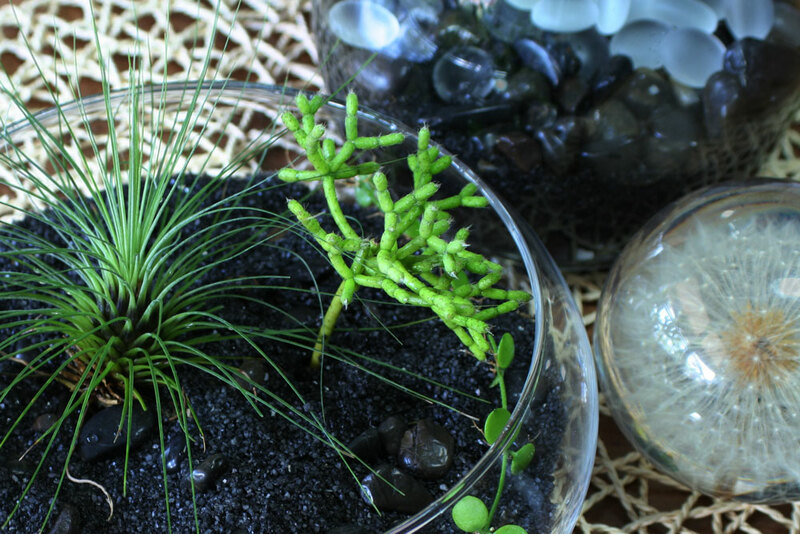 This one uses plants and accessories that mimic the fauna of a beach or coral reef: Seashells, sand, sea glass and some decidedly aquatic looking epiphytic cacti and air plants (Tillandsias and Dischidia) that require very little care. Succulents such as Echeverias and Sedums are also excellent choices for this theme. If you like it old school, try making a wardian case like the one I've shared at the top of this post. 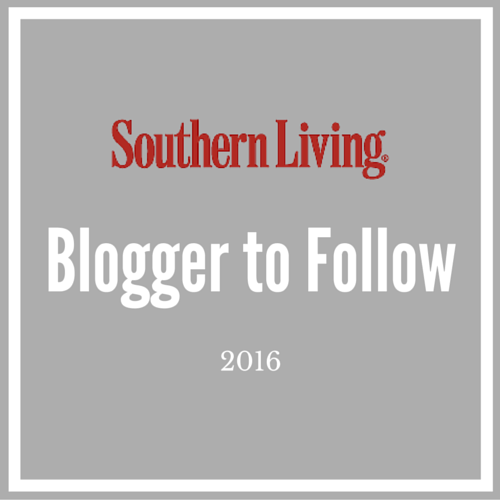 Mary Ellen Gambutti's guest post is a lot more informative though. Here she shows us how to plant a super exotic looking wardian case with some colorful bromeliads and outlines every single step with a photo and instructions. 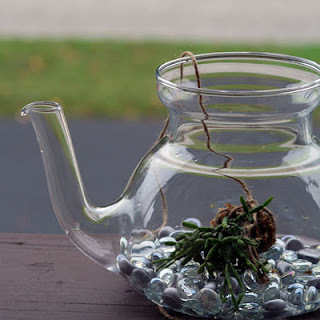 This incredibly simple design uses a glass teapot and a teabag (yes, I said teabag) of spaghnum moss and succulent cuttings. To provide a little drainage, I've added a single layer of silver glass beads. To water, I fill it up to just above the layer of glass beads to let the moss soak it all up. That's it! Like I said, it's pretty darned simple. Terrariums don't need to take up a lot of space, and this one is no exception. 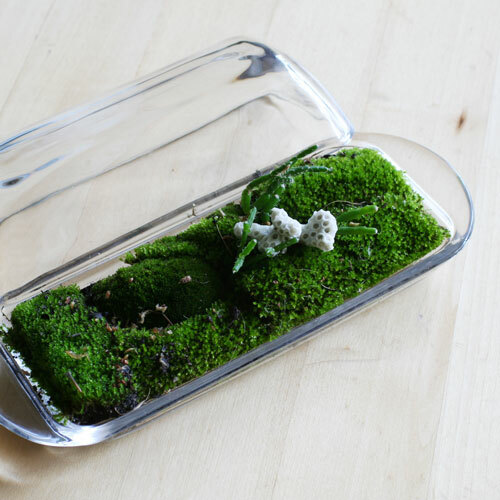 All I've done is purchased a cheap butter dish, filled it with moss, and added a Hatiora cutting. Hatiora and Rhipsalis are both epiphytic cacti that I like to use for their carefree nature and manageable size. 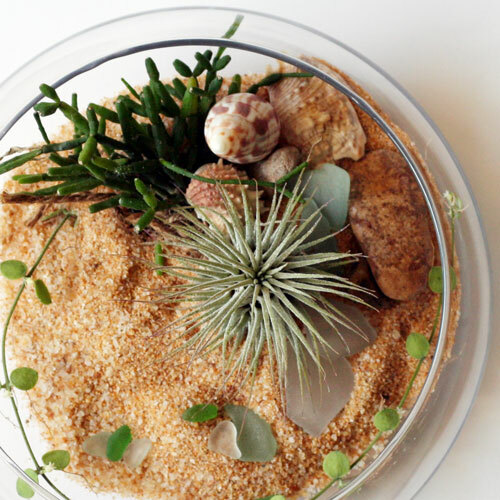 As if terrariums didn't attract enough attention already, this one positively glows! This recent project was created using a wine decanter, black sand, frosted glass beads and LED lights. Next time my wife and I have a candlelit dinner, maybe I'll whip out this bad boy instead. 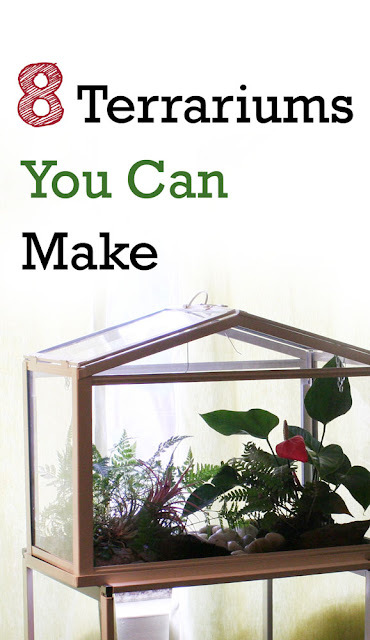 These projects both utilize epiphytes for container-less gardening, and they're both a lot of fun if you happen to already like terrariums. They're really more like terrariums turned inside out! 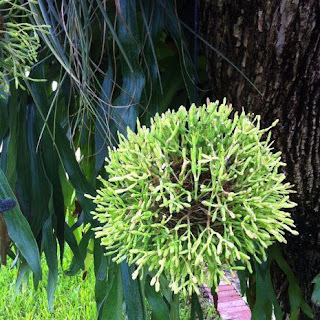 This is my signature project: Grapevine balls stuffed with sphagnum moss, planted with epiphytic cacti, bromeliads and orchids. You can even use succulents if you'd like, but the tropical tree dwellers are just perfect for my fully shaded balcony. Rainforest drops can be hung from the ceiling, on the walls or simply set out on their own. The beautiful one to the left was grown by my sea bean collecting friend Gina Tracey Reed, and it reminds me that I need to step up my game. 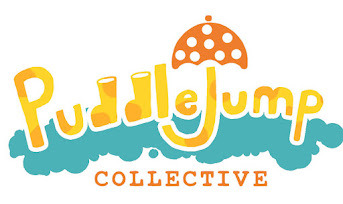 Another project using Rhipsalis? 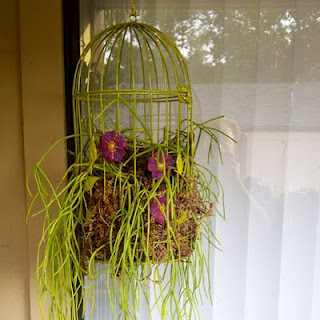 As was the case with the Rainforest Drops, I used Rhipsalis for my shady balcony but any drought tolerant succulents will work with for this project. Just make sure the birdcage is made of metal so that it doesn't rot away! The birdcage can be set on a stand or better yet, hung from the ceiling. 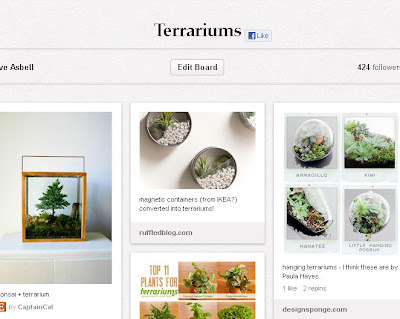 For more neat terrarium ideas, check out my new Terrariums board on Pinterest! Have questions? Let me know in the comments and I'll try to answer ASAP! 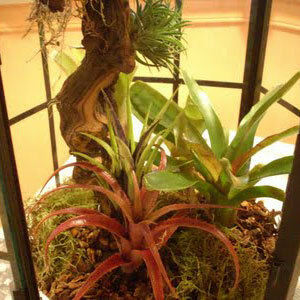 Very nice terrariums! I love them all! Duuuuude... are you trying to kill me? I haven't even managed ONE yet and you go right ahead and make ten of those sweet lil' things? 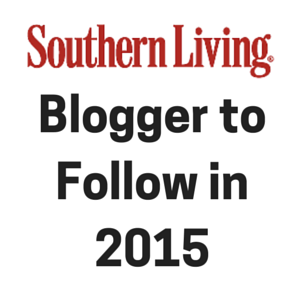 Thanks for the pinterest link, obviously I'm following now. wow - like the previous commentor here I was thinking I should try one of your lovely projects and you have already completed 10! I cant decide on a favourite - they are all so individual. Ohhh how I have a strange love for those magical little worlds of terrariums. 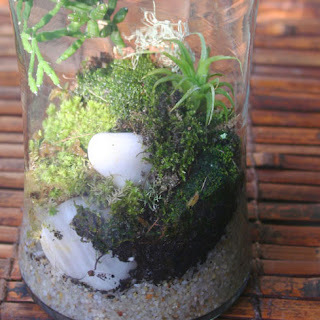 Don't know why but ever since I was a kid I always loved terrariums, so much fun to make. Love all your ideas, very inspiring. Thanks for the super awesome post. Hope you have a wonderful weekend!